RISE is a teen leadership program serving 7th, 8th, 9th and 10th grade students in the City of Chester. 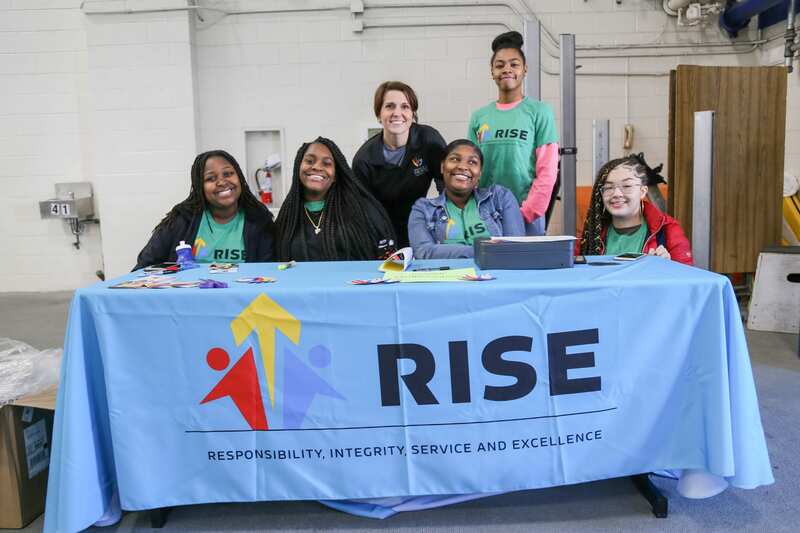 RISE develops leadership through fostering personal Responsibility and Integrity, providing opportunities for Service, and instilling an expectation of Excellence in its participants; of themselves and of their community. RISE is designed to build vital skills that will help the participants RISE to their potential and understand their purpose in life. It is a year-round program with service projects, artistic and multi-media workshops, cultural events, field trips and a week-long residential camp experience. It is designed to be both developmentally and culturally appropriate. RISE expects its participants to become high-achieving individuals, positive influencers in their peer groups, and righteous leaders in their schools and neighborhoods as they model personal Responsibility, Integrity & Excellence, and also demonstrate leadership through acts of Service in their community. RISE students will elevate their character and competency and in turn, elevate their community. The program is based on the tenets of self- determination theory that states when a person feels connected, feels competent and has a sense of autonomy that this will lead to a state of positive well-being. RISE takes this theory one step further, to affect not just an individual, but is aimed at elevating the well-being of an entire community. Through these themes, students understand the power of their voice in the community, and to become advocates for the City of Chester. The curricula are designed around Project Based Learning (PBL) and 21st Century Learning Skills, including communication, collaboration, initiative and self-direction, and a genuine sense of accountability for self and community. The lessons utilize PBL, which students gain knowledge and skills by working for an extended period of time to investigate and respond to an engaging and complex question, problem, or challenge. All lessons focus on the goal to not only help the students RISE to their potential, but for them to help Chester RISE as well. RISE is a program to help adolescents understand that they are a powerful and needed part of their community. RISE wants every student to see their God given potential, and to be grateful for the opportunities and responsibilities that they have as members of their community. RISE helps students understand what they can do to be part of their community, but more importantly helps each student identify who they can become, and the collective impact they can make as young citizens. Check out a sample of a RISE lesson plan.